‘Action!’ draws on the very best published and unpublished interviews of the ‘Bright Lights Film Journal’, and contains many gems, including the last ever interview given by Francois Truffaut, four months before he died. ‘Action! 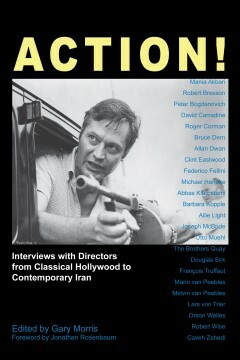 Interviews with Directors from Classical Hollywood to Contemporary Iran’ presents nineteen outstanding interviews with directors past and present, from around the world, working in a variety of genres and budgets and production environments from major studios to indie and DIY. The result is a vibrant group portrait of the filmmaking art, a kind of festival in words that explores everything from the enormous creative and personal satisfactions of filmmaking to the challenges and frustrations that range from meddlesome studio heads to state censorship. These articulate auteurs include iconic figures Fellini and Truffaut (in his moving final interview), avant-garde masters Otto Muehl and the Brothers Quay, social critics Barbara Kopple and Allie Light, mainstream mavericks Robert Wise and Douglas Sirk, and eleven others. While their work (and working methods) varies widely, these directors share the status of pioneer and subversive, fighting – sometimes against great odds – to put their unique vision onscreen. Gary Morris publishes and edits ‘Bright Lights Film Journal’ and is the author of the monograph ‘Roger Corman’ (1985) in the prestigious Twayne Theatrical Arts Series.